We’d love your help. 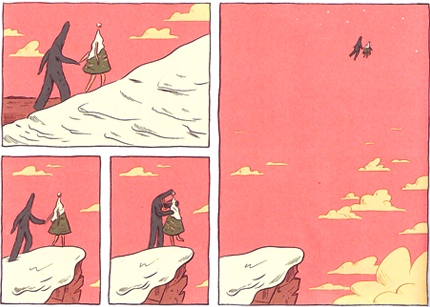 Let us know what’s wrong with this preview of Hilda and the Midnight Giant by Luke Pearson. 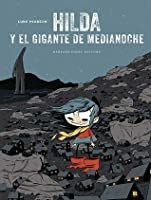 In Hilda and the Midnight Giant, our protagonist finds her world turned upside down as she faces the prospect of leaving her snow-capped birthplace for the hum of the megalopolis, where her mother (an architect) has been offered a prestigious job. During Hilda's daily one-and-a-half hour trek to school she looks for ways to stall her mother's decision. She conspires with t In Hilda and the Midnight Giant, our protagonist finds her world turned upside down as she faces the prospect of leaving her snow-capped birthplace for the hum of the megalopolis, where her mother (an architect) has been offered a prestigious job. During Hilda's daily one-and-a-half hour trek to school she looks for ways to stall her mother's decision. She conspires with the beings of the mystical Blue Forest to delay the inevitable. Will they help or hinder her? More importantly, who is this mysterious Midnight Giant? This is the second part of the Hildafolk series, a series that follows Hilda on her many adventures and travels through the magical fjords and enchanted mountains of her birthplace as she unravels the mysteries of the supernatural world that surrounds her. To ask other readers questions about Hilda and the Midnight Giant, please sign up. My 7 year old liked book 1, but the show was way too scary. What age group so you feel this book is good for? Albos It is a little scary, but it is like a child horror style, isn't it? More darky than scary. I think it is like Roald Dahl's books, and a child, most…moreIt is a little scary, but it is like a child horror style, isn't it? More darky than scary. I think it is like Roald Dahl's books, and a child, most of them, at least, can read these comics without any problem. This was super cute but super short. Looking forward to the other Hilda volumes! Amorzinho em forma de livro! Another killer book by Luke Pearson. The Hilda series might be my favorite kids series (not that I read enough of them to really know). At times I felt like I was reading the modern Tintin - the adventerousness, the great artwork, and the large format with lots of panels. There are definite Spirted Away vibes present with the numerous strange situations and characters Hilda meets in the story. I loved the idea of Hilda 'ignoring' the elves, just as the giants ignore humans. All three species liv Another killer book by Luke Pearson. The Hilda series might be my favorite kids series (not that I read enough of them to really know). At times I felt like I was reading the modern Tintin - the adventerousness, the great artwork, and the large format with lots of panels. There are definite Spirted Away vibes present with the numerous strange situations and characters Hilda meets in the story. After reading and enjoying the first book in the Hilda children's graphic novel series, I grabbed the second volume right away. I was pleased to see this one is twice as long as the first book. Still only 40 pages, but at least there's a bit more content here. While I didn't like the story quite as much as the first one, it's still very cute and quirky. Recommended! Милішим за цей комікс може бути тільки однойменний мультик. Beautiful little book. Quirky critters, delightful colors, great, layered story. I am looking forward to reading again and perhaps will write a bit more here. I highly recommend. Another wonderful outing for Hilda. The artwork in service of good storytelling is gorgeous. There are plenty of great jokes in a short space of time and things that happen have real consequences for our adventurer. I already have the next two in the series and I'm going to resist reading them all at once so I have something to look forward to. Pearson's second venture feels far more like a story than his first venture. In Hilda, it felt as if he had the characters and the world but was tentative in letting loose with either: it was more of a light introduction. 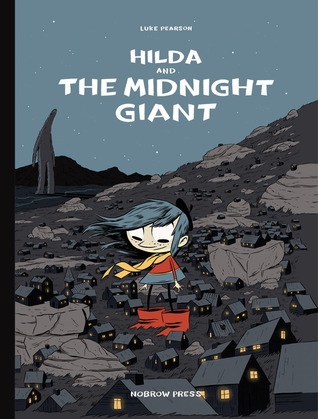 Hilda and the Midnight Giant is Pearson taking that next step. With the landscape set alongside Hilda and her mother, he found room to expand in all elements of his storytelling. There is more text here (which works for the better) and there is a sense of tension now between mu Pearson's second venture feels far more like a story than his first venture. In Hilda, it felt as if he had the characters and the world but was tentative in letting loose with either: it was more of a light introduction. Hilda and the Midnight Giant is Pearson taking that next step. With the landscape set alongside Hilda and her mother, he found room to expand in all elements of his storytelling. There is more text here (which works for the better) and there is a sense of tension now between mum and Hilda as they argue over moving from the valley into the local town. Hilda is mortified by the idea and both characters, in a way, reminded me of My Name Is Mina. Without wanting to give away any spoilers, I did like the play on giants, size and Hilda's utterly naturalistic affinity for this wonderful, magical world which grows annually within Pearson's mind. Hilda and her mother live in a cottage in the middle of an empty valley - or at least they think it's empty. They begin receiving tiny letters from elves who say that the valley is theirs, so Hilda takes it upon herself to seek them out and find a solution to their co-existence. Oh, and there's a giant that only comes out at night and only Hilda can see. Luke Pearson goes all Miyazaki in this kids story with lots of fantastical creatures and quests with a little girl as hero. It's a charming and Hilda and her mother live in a cottage in the middle of an empty valley - or at least they think it's empty. They begin receiving tiny letters from elves who say that the valley is theirs, so Hilda takes it upon herself to seek them out and find a solution to their co-existence. Oh, and there's a giant that only comes out at night and only Hilda can see. Luke Pearson goes all Miyazaki in this kids story with lots of fantastical creatures and quests with a little girl as hero. It's a charming and pleasant read, aimed at people much younger than myself (I'd say around 7/8 years old), and much less morose than his last book "Everything We Miss" which was definitely not a kids book. That said, the book plays along similar lines about the details in our lives that we don't see for whatever reason, and there is an interesting idea in this book about world perspective with the tiny elves, the large Hilda, and the even larger Giant who makes Hilda look tiny as the examples. Cute and while the drawing style isn't as much to my liking as in the other books, I still enjoy the captivating combination of fantastic creatures that are very real not only to Hilda but her mother as well. I did miss the wooden man and the invisible miniature elves were cute but not as interesting a concept. Also wish it had gone just a little bit more in detail about co-existence between the elf civilization and Hilda's home, since it's briefly mentioned with the relationship between giants Cute and while the drawing style isn't as much to my liking as in the other books, I still enjoy the captivating combination of fantastic creatures that are very real not only to Hilda but her mother as well. I did miss the wooden man and the invisible miniature elves were cute but not as interesting a concept. Also wish it had gone just a little bit more in detail about co-existence between the elf civilization and Hilda's home, since it's briefly mentioned with the relationship between giants and humans. I love how well-developed this world is. Things that were passing mentions in the first book reappear here. This feels reassuring - like Pearson has mapped this world out, and isn't just randomly throwing in things he thinks are cool. Srsly tempted to read more than two of these. And maybe add them to my personal collection I love how well-developed this world is. Things that were passing mentions in the first book reappear here. Quando ho iniziato a vedere la serie animata Hilda su Netflix l'ultima cosa che mi aspettavo era che mi sarei ossessionata in questo modo. Ho divorato la serie, l'ho inserita subito tra le mie preferite di sempre, ho messo delle fan art come sfondo sul telefono e infine ho comprato la graphic novel della mia puntata preferita. Semplicemente adorabile. Non lunghissima, ovviamente, visto che è per bambini, questa storia mi è rimasta nel cuore e ho tratto anche degli spunti notevoli e davvero profo Quando ho iniziato a vedere la serie animata Hilda su Netflix l'ultima cosa che mi aspettavo era che mi sarei ossessionata in questo modo. Ho divorato la serie, l'ho inserita subito tra le mie preferite di sempre, ho messo delle fan art come sfondo sul telefono e infine ho comprato la graphic novel della mia puntata preferita. Semplicemente adorabile. Non lunghissima, ovviamente, visto che è per bambini, questa storia mi è rimasta nel cuore e ho tratto anche degli spunti notevoli e davvero profondi. I liked this second "Hilda" book more than the first: the art is as whimsical and gorgeous as it was in the first book, and there's a bit more of a story. Just after the book opens, Hilda and her mom hear a knock on their door: but when Hilda opens it, no one's there. Hilda finds a tiny envelope on the grass outside: it's the latest in a series of threatening letters (all equally tiny). The letters, all of which are from local elves (who are invisible to Hilda and her mom) all say that Hilda and her mom have to leave their home. But things quickly escalate after the arrival of this letter: stones come through the windows, and the elves announce that Hilda and her mom are being forcibly evicted. Hilda manages to prevent that from happening, but her mom suggests that maybe they should move to town anyway: it'd be better for her career, and maybe better for Hilda, too. Hilda's having none of it, and her mom agrees that if she can get the elves to let them stay without further harassment, then they can stay. Meanwhile, the elves aren't the only fantastical creatures around: late at night, Hilda keeps seeing a giant who's unfathomably enormous, mountain-sized. Size is relative, of course: Hilda's as much of a giant to the elves as this giant is to her, and the idea that we're all going about our lives, possibly oblivious to/overlooking others around us, gets played with in humorous and satisfying ways. Hilda and her mom live in a lovely little place that is quiet and isolated. They enjoy being in their little valley that has been in the family for generations. However, someone doesn’t want them there. In fact, they keep getting small-sized letters warning them to move. But Hilda doesn’t want to move. Neither does her mother. So they stay. Then they are attacked. But they can’t see who is attacking them. Later one invisible elf decides to let Hilda in on a secret. There is a whole country of elv Hilda and her mom live in a lovely little place that is quiet and isolated. They enjoy being in their little valley that has been in the family for generations. However, someone doesn’t want them there. In fact, they keep getting small-sized letters warning them to move. But Hilda doesn’t want to move. Neither does her mother. So they stay. Then they are attacked. But they can’t see who is attacking them. Later one invisible elf decides to let Hilda in on a secret. There is a whole country of elves who live in the same valley and who are tired of Hilda and her mom stepping on their houses. (Even though since they can’t see them they aren’t really doing any damage.) So this elf gives Hilda the paperwork that will allow her to see the elves. And her eyes are sure opened. As Hilda tries to figure out a way for the elves and her family to live peacefully as neighbors, Hilda realizes that they aren’t the only ones around who she didn’t know about. There is a mysterious giant that comes every midnight. Hilda doesn’t know who he is or what he wants, but she is determined to find out. Hilda and her mother live in the wilderness in a tiny house- that just so happens to be surrounded by the houses of tiny, invisible elves. These elves want Hilda and her mother to leave this land for good. Hilda sets out to convince the elves to let her stay, and encounters a mysterious giant along her journey. These drawings, and the imaginative characters (especially the flying furballs that were migrating) seemed very reminiscent of Miyazaki- especially in Princess Mononoke. Slightly less weir Hilda and her mother live in the wilderness in a tiny house- that just so happens to be surrounded by the houses of tiny, invisible elves. These elves want Hilda and her mother to leave this land for good. Hilda sets out to convince the elves to let her stay, and encounters a mysterious giant along her journey. These drawings, and the imaginative characters (especially the flying furballs that were migrating) seemed very reminiscent of Miyazaki- especially in Princess Mononoke. Slightly less weird characters and creatures, I think, but still along the same line of imagination. Hilda is strangely drawn- not a cute little girl, but not an annoying one either. She has independence and strong will, and yet can adapt and choose carefully. I like her as a main character. As far as the giants go, I think they are adorable. I can absolutely see how this artist's imagination works- he is the same author/illustrator who did the Johnny Boo series. And I'm thinking of the Ice Cream Monster with the long skinny arms and tall body-- he is very much like the giant in this story. And yet I'm not mad at the lack of creativity... rather, I think Luke Pearson has improved upon the Johnny Boo series for children into a slightly more mature story for middle/young adults. The artwork is so distinguishable and distinct- I can't believe I didn't notice it as soon as I picked up the novel. 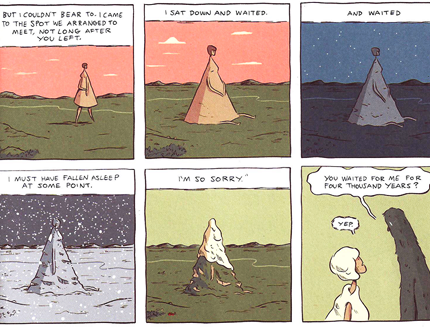 Luke Pearson expands on the world he introduced in 2010's short intro Hildafolk. This first full Hilda adventure teems with fun new creatures and characters, and is gently plotted in a way that recalls Tove Jansson's best Moomin strip stories. Luke's art now delights in this wild natural world and breaks out into some extra-impressive layout every couple of pages. I'm looking forward to more of this series, and more comics in general that hit this tone. Everything started to get smaller. People appeared and built towns. The giants would accidentally step on them. There were arguments... fights. It just wasn't their world anymore. So they had to leave. But no one knows where they went. Some say they all just jumped as high as they could and drifted off into space. 2.5 stars. I wasn't as crazy about the plot of this one as I was about Hilda's first adventure, but I did love the giants' arc. This one was sadder, but still visually soothing to my soul. And emotionally soothing too. And I just really want everyone to be okay. (view spoiler)[I wanted to cry re. the house. I hope everyone is okay. I am definitely projecting here but I would be so so devastated to leave the woods and the creatures and go to town. Town was only a train ride away! These books just get more and more gorgeous, I swear. Numerous quotes on the back covers suggest that the Hilda books are like a glorious blend of Hayao Miyazaki and Tove Jansson - this is so accurate. But Hilda is also wholly her own character in her own world and it's wonderful. Hilda and her mom are threatened by creatures both tiny and giant, and must find a way to live peacefully with both lest they be forced to move to the dreaded town nearby. Hilda is one of my new (to me) favorite characters in kid's lit. She's plucky and courageous, and pretty dang smart! A pleasant surprise! This one feels much more like a thoughtful, finished story than the first one, and it gives me hope for the rest of the series. Generally, the character development is more minimal than I usually like, but the play with scale and volume in this story is really well done. Harper loved this graphic novel and we had fun reading it together. She loved Hilda and recognized a few of their common traits- making friends with giants and elves being one. Charming little story with whimsical artwork and curious characters. The ending was a little abrupt and went against Hilda's motivation, but my 10YO wasn't bothered by it at all.